As much as I’m an autumn and winter kinda girl, there’s just something about the sunshine and long summer days that has me wanting to make some instant updates to my fashion and beauty wardrobe. In terms of the latter, I need any excuse, whereas when it comes to fashion pieces, I’m always that bit more conservative. Adding a splash of colour and accessorising is more my thing, but the odd summer top and dress never goes amiss. 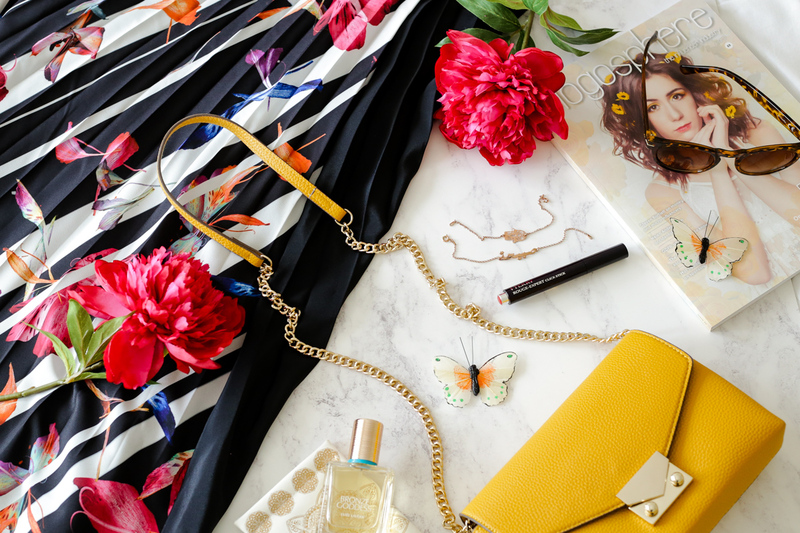 You’ll know from my recent Wardrobe Update that I splashed out on a few key essentials, most of which should see me through the summer but I might have made a few more sneaky purchases since then. They’re all being put to good use and here’s what’s made the cut in terms of my current summer fashion and beauty favourites. I’m not one of those people that relishes in showing too much skin. That’s why I always find it hard to find that perfect summer dress. Maxi dresses are by far my favourite but since I’m petite, finding one that doesn’t need to be taken up is a challenge. This Katie Print Pleated Maxi Dress from Coast is perfect because it’s also available in petite and the contrasting black bodice and capped sleeve provides just the right amount of coverage. I bought this for the Blogosphere Awards a couple of weeks ago and this floaty number can be dressed up or down so I’m going to be getting a lot of use out of it this summer. Mustard or anything in the yellow family is something I always struggle with when it comes to clothing. However, this Chain Cross Body Bag from Mango has drawn me so many compliments and I think it’s the best way to embrace this hue. Next to my emerald green bag which you can see here, I’m pretty much covered in the must-have bright bags this season. If there is one fragrance that screams summer it has to be Estēe Lauder’s Bronze Goddess. Eau Fraiche is lighter than the parfum but still has that exotic blend of Bergamot, warm Amber, Vanilla, Tiare Flower and that signature creamy, coconut scent. The fragrance is quite literally summer in a bottle and has a sun-kissed and alluring vibe to it – I really can’t get enough. I love all kinds of accessories but there’s a special place in my heart for anything that’s extra dainty and all the better in rose gold. It was an absolute delight, therefore, to have had the opportunity to choose two pieces of jewellery from oNecklace. 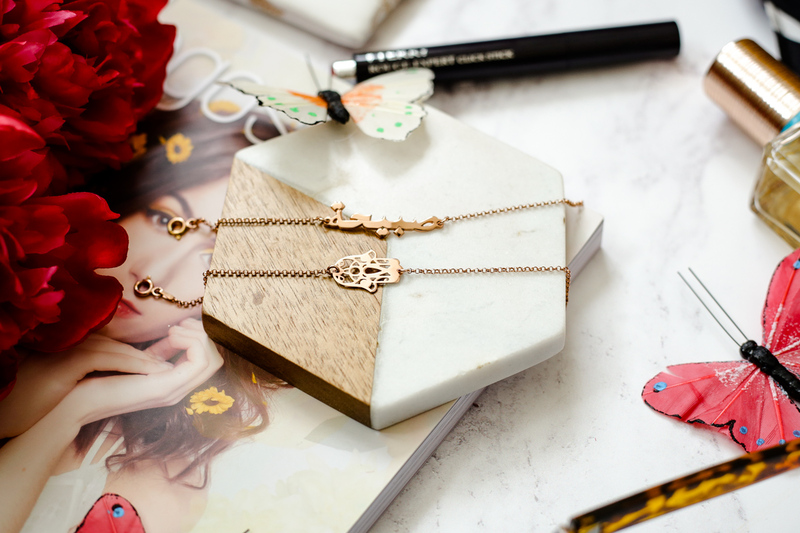 Specialising in personalised items, oNecklace have an array of stunning pieces to choose from; infinity bracelets and necklaces to name bracelets and engraved rings. Whether you go for personalised items or not, the designs are authentic and unique with options to choose either gold, silver or rose gold plated. I went for an Arabic Name Bracelet * and this Hamsa Hand Bracelet * both in rose gold. They look good worn together or separately and I absolutely adore the simplicity of the designs. Ordering selecting my preferences was super easy on their website and you can check out their full range here. I’d happily rock a red lip all year round but in summer you can get away with it that bit more. Against tanned skin it doesn’t look so garish and the brighter the better in my opinion. 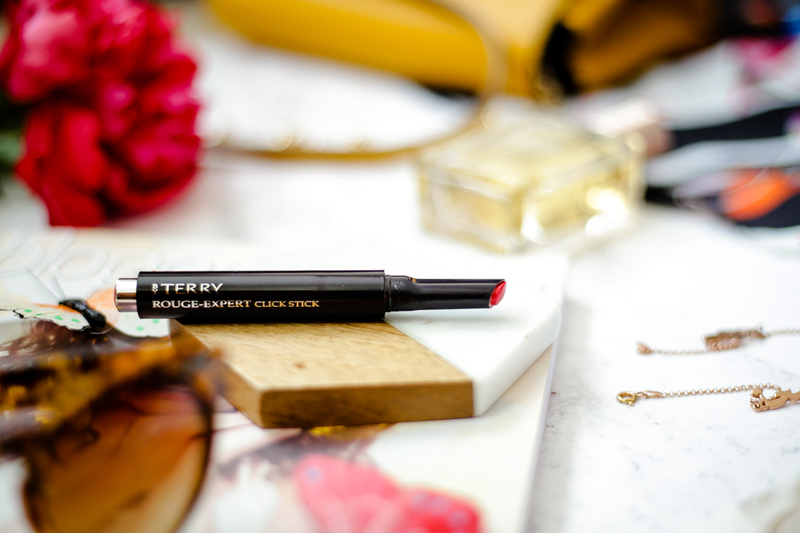 My current favourite is the By Terry Rouge Expert Click Stick in My Red. This 3-in-1 hybrid formula gives you the richness of a balm, a bold pigment and the precision of a lip pencil. My Red is a classic red adding that gorgeous pop of colour to the lips. The teardrop shape and click applicator makes it very easy to apply and it’s also a great one to pop into your handbag for when you are on the go. It dries to a velvet matte finish but feels super comfortable on the lips and doesn’t bleed. I can’t wait to check out more of their shades because the formula is just perfect.